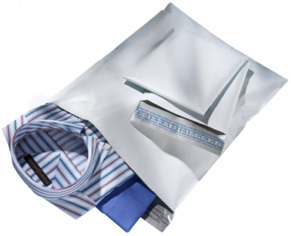 Poly mailers are a common packaging option for apparel companies, outdoor gear brands, and companies that sell accessories like socks and undies, etc. Poly mailers are inexpensive, thin, lightweight, durable, difficult to tear, and a single size can easily fit a variety of different items. But poly mailers are made with plastic (which is why they have all of these qualities!). If you are looking to go plastic-free, finding an alternative to poly mailers is often the first - and most important - step. What should you transition to? In almost all cases, we recommend moving from a poly mailer to a recycled paper-based solution - either a paper-based envelope mailer or a corrugated shipping box. There are other fiber-based packaging options on the market, such as hemp paper. However, these are not readily available, are still quite expensive and are not ecologically superior to recycled paper solutions. We also know that some companies look into bioplastic as a poly mailer alternative. However, bioplastic is not a plastic-free packaging solution. If you do determine that the qualities of plastic are essential to your packaging strategy, then plastic-free may not be the right sustainable packaging goal for your business. Consider an alternative packaging goal (such as Zero Waste Packaging) and explore recycled and recyclable poly mailers as one potential option. Mailer or box? Boxes are typically more expensive, operationally cumbersome, and take up more space than paper mailers. 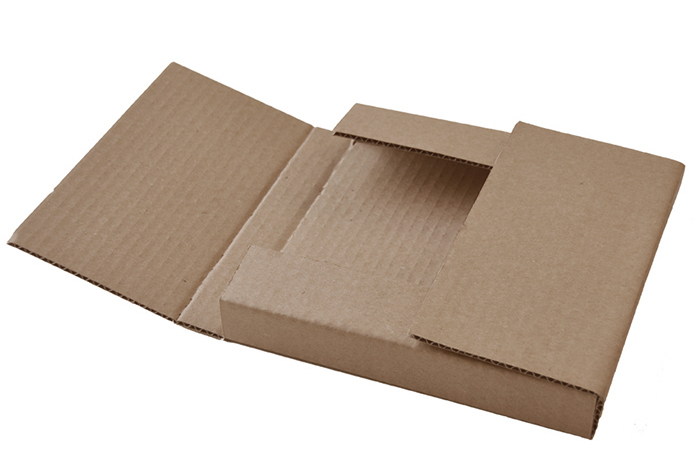 Additionally, corrugated boxes use more material than equivalent sizes of paper mailers, and are therefore less environmentally friendly. Because of this, a mailer is typically a better poly mailer alternative than a shipping box. On the other hand, some companies need more durability and strength than a paper mailer can provide. If this is you, a box (and in particular, an OPF shipping box) could work well for you. What should you look in a Paper Mailer? There are a variety of paper-based mailers out there, ranging in strength, protection, shape, and flexibility. As you begin exploring paper-based alternatives to poly mailers, consider the following features. Strength and durability: Are you packaging something heavy or bulky (like a jacket or a backpack) or something fairly small and lightweight (like socks)? Do you typically have several items that ship out to a customer in one package, or are most of your orders for single items? Storage: How much space does your facility have for storage? Plastic-free alternatives to poly mailers will almost always require more space for storage and some solutions (like boxes or cushioned mailers) will need more than others (like thin paper mailers). Product variety: Do you need a single set of packaging solutions that will work for a large variety of shipments (i.e. ranging from a single t-shirt to a tent to a pair of shoes)? Or are your outbound orders fairly similar in type and size? Cost: You will likely see higher costs when you move from poly mailers to plastic-free alternatives, both in the product itself, as well as in the cost of shipping packaging to you, and in your outbound shipments. However, thicker, stronger options certainly cost more than thinner ones. Weather or liquid protection: Is your product very sensitive to weather issues? If so, will you need thicker, stronger paperboard, a cushioned mailer, or a box? Thinking through the above questions will help you clarify the most important features you need to look for when choosing a new packaging solutions. The following mailer characteristics will be helpful to assess when evaluating and comparing different paper alternatives to poly mailers. Paperboard thickness: When looking for the right paper thickness for your needs, you'll want to strike the right balance. The thinner the paper, the more it can crease and tear under the weight of its contents and its journey. However, if the paperboard is too thick, it can be more difficult to work with because the mailer won’t flex to fit the shape of your product. How are paper thickness and weight measured? There are two standard measurements. Pounds refers to the weight of the paper, measured by how much 500 standard size sheets weigh. Card stock or paperboard typically range from 50 to 140 pounds. Points measure paper thickness, and simply refer to the thickness of the sheet using calipers. Each point represents 1/1000th of an inch. The higher the value, the thicker the paper. Gussets: Some mailers have a gusset (on the side or the bottom) that allows them to expand to better fit their contents. Consider the following (image 1 with a flat kraft mailer versus a gusseted mailer) and the following (paper fit mailer versus flat kraft mailer). Gussets help mailers better fit bulkier items. Top and bottom expandability: Some mailers have top and/or bottom creases (such as this one pictured) that allow for easy top and bottom expansion, enabling the mailer to conform to bulky contents. This feature provides the three dimensionality of a shipping box, with the cost and ease of use as a mailer. Padding: Some mailers, such as this one, have a layer of protective padding, which can be an important addition for when shipping certain items. Size: You’ll want to find the right size or sizes for your mailers. Too small, and your product won’t fit in it well, or will bulge out so much that it makes the package sensitive to damages. Too big and your product will get lost in the package, and you’ll be overspending on both packaging and your shipping. Recycled content: If sustainable packaging is your focus, you'll want to look for the highest percentage of recycled content possible, maximizing post-consumer waste in particular. Paper can be recycled four to seven times before it reaches the end of its useful life, and ecommerce packaging is uniquely suited to use recycled content (unlike use cases such as food grade packaging or glossy magazine paper). If for some reason, you find that recycled content is not suitable for your needs, seek our virgin paper sourced from sustainably certified forests. Which EcoEnclose Paper Packaging Solution is best for you? If you are looking for plastic-free poly mailer alternatives, we have several options for you to consider. Our most popular plastic-free alternative to poly mailers! 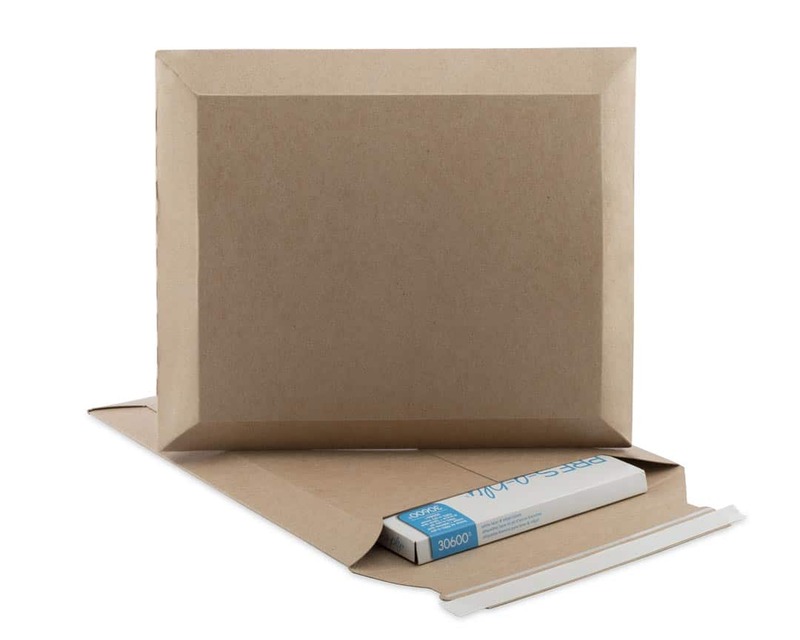 This 100% recycled, recyclable mailer is made with 100# kraft paper. It often works well when shipping a single item, especially when products are relatively lightweight. 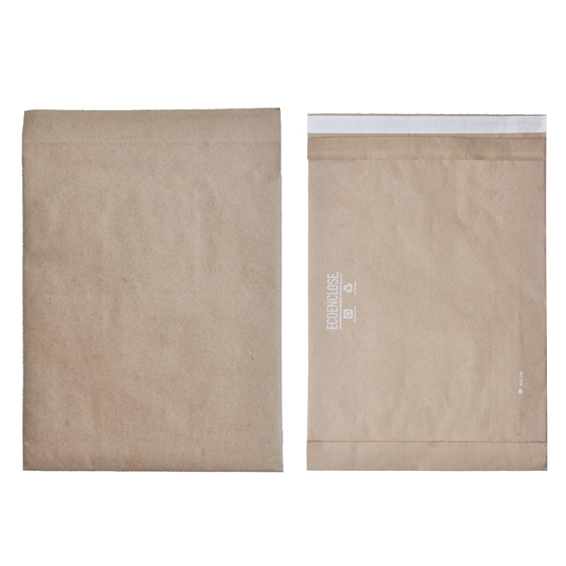 We carry seven sizes of these kraft mailers, of which two are gusseted. They can be custom printed at quantities of 500 or more. As their name suggests, these mailers have a layer of padding, adding dimension and protection to the packaging experience. If you've already designed your operation (and budget!) around poly mailers, moving to boxes can be challenging. Boxes need to be assembled and taped, which changes your fulfillment work flow. They take up more storage space, and they can be significantly more expensive to ship. However, if you're shipping something large and bulky, you may find that the strength and thickness of a shipping box is required. If so, we recommend a One Panel Fold (OPF) box. You can lay this box flat, put your products on it, and then assemble the box around the items you are shipping. Unlike other box styles, these can have a very low height (less than 0.5"!) so you can design an OPF without unnecessary dunnage. Our newest paper mailer will be available soon! We designed this mailer specifically for this question - "Is there a paper mailer with the strength and flexibility of a poly mailer?" It has been developed specifically for companies going Plastic Free whose products and shipments are too large, bulky and/or heavy for a 100% Recycled Kraft Mailer. The 100% Recycled Paper Apparel Mailer is made with thicker, stronger paper stock than the Kraft Mailer (15pt, which is about 50% stronger than the 100# paper used for the Kraft Mailer), but it is not so thick that it is cumbersome to work with and creases too much. It has a unique expandability design (see picture), meaning that it expands into a three dimensional, box-like shape when you are putting your products in it. It is available in five sizes, and the larger sizes are also gusseted for extra expansion. The following chart summarizes the these three paper mailer options. Can be custom branded at quantities of 500 or more. Can be custom printed at quantities of 500 or more. 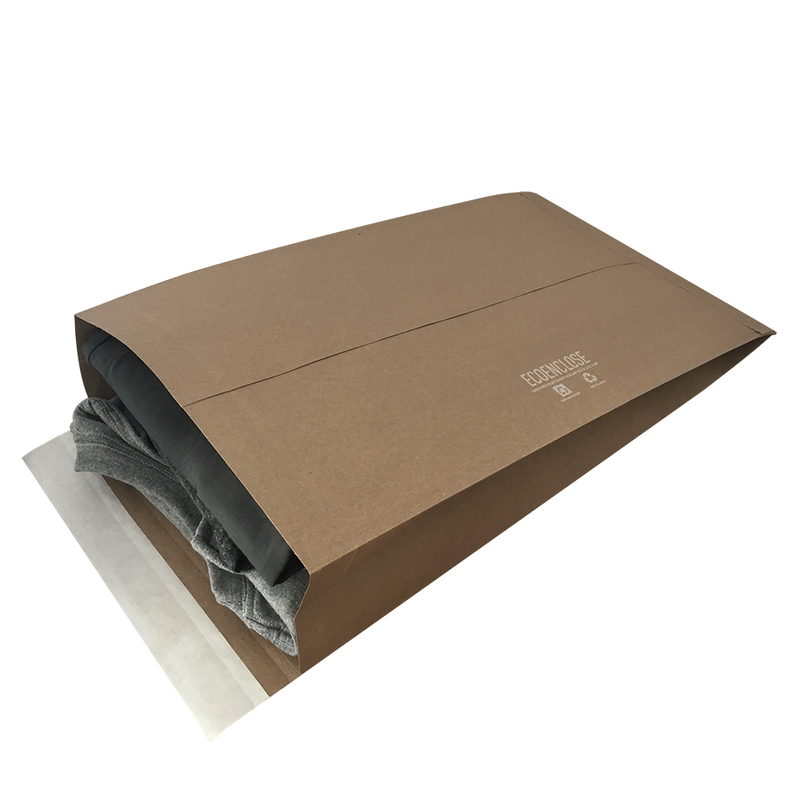 EcoEnclose Paper Apparel Mailers will be ready to ship by late March 2019. Want to be updated as soon as they are available? Click here to let us know.